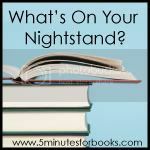 Time again for another What's On Your Nightstand over at 5 Minutes for Books. The Scarlet Letter , by Nathaniel Hawthorne. I did so! Review forthcoming. Little House on the Prairie in conjunction with the Laura Ingalls Wilder Reading Challenge being hosted by Barbara at Stray Thoughts. I'm reading this one aloud with Bookworm1 at the present moment and am hoping to finish it within the next week. Pew Sisters, by Katie Schuermann. The title is linked to my review over at 5 Minutes for Books. 1 and 2. 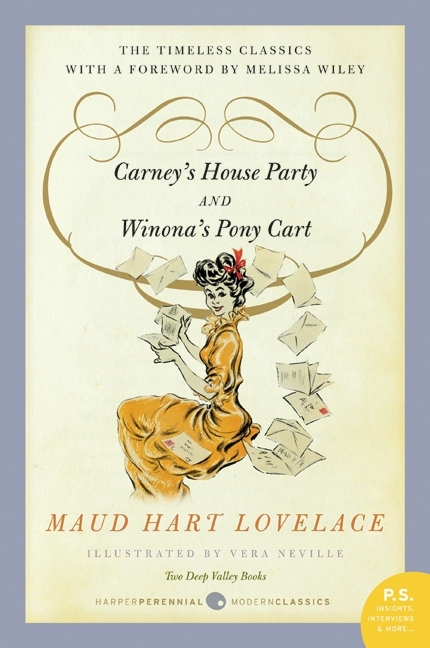 Carney's House Party and Winona's Pony Cart , both by Maud Hart Lovelace. I'll be reading this as part of the Reading to Know Book Club. Annette is leading the discussion for the month of March and she is allowing us to choose whichever title we like by Maud Hart Lovelace. I own this book (which contains two titles) but haven't read either yet. Looking forward to them! 4. Breakfast with Bonhoeffer: How I Learned to Stop Being Religious So I Could Follow Jesus , by Jon Walker. I sought this one out so I'd really best get to it! 5. 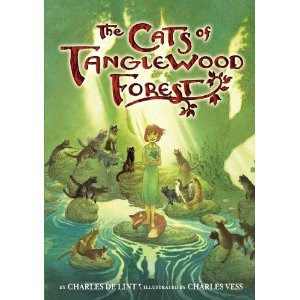 The Cats of Tanglewood Forest , by Charles de Lint. This is a new piece of middle grade fiction that sounded moderately interesting and so I thought I'd give it a go. Actually, I'm feeling a little top heavy as relates to review copies of late. I have this suspicion that there are more on the way that I accepted and then forgot about. I fear that by the end of March I'll be climbing walls to get away from the pressing demand of review copies and will desire all the freedom in the world again to read whatever I like from my own home book cases. (Several titles are currently calling to me and I'm forcing myself to ignore them at the present.) I shall slip in my own personal choices when and where I'm able. But the above titles I must get to. Soooo, that is what is on my nightstand at the present. What's on yours? Ah, Carney's House Party. . . Yes! I read Winona to the girls last year (or the year before? ), but I forgot about Carney. Maybe that's what I'll read for the Bookclub! Looking forward to reading several of your reviews, especially the Maisie Dobbs and Bonhoeffer titles. I've never read Lovelace, so I am looking forward to that. 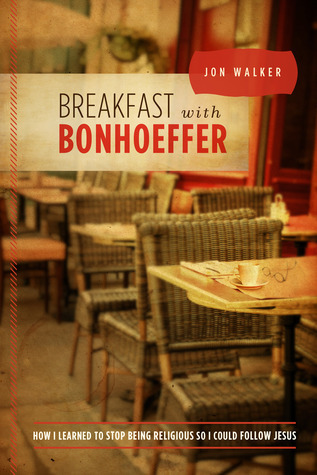 Breakfast With Bonhoeffer sounds intriguing -- I'll look forward to your thoughts on that. You just reminded me I need to attempt to get a Lovelace title. I'm especially looking forward to March's Bookclub! Can't wait to read your thoughts on The Scarlet Letter. ALso I must get the Bonhoeffer- love him...looks interesting ! Please review! Love your list as usual! I'm about to dive into "Comforts From Romans" for the March challenge. I need to hop over and check out your review! On your recommendation, I just picked up a Charles Todd book from the library (I had to get the first one on CD). I am currently reading Farmer Boy to the children and I will be writing my first ever guest post for Mr. Diary of An Autodidact on a Maud Hart Lovelace book for the Reading to Know book club. I adore MHL. I just need to decide which book. Possibly one of Lovelace's adult books, but then I love the BTT books. So many choices! Scarlet Letter is such an interesting book. I read it with some Mauritanian students and it was interesting to see their take on it--suffice it to say they completely missed the point. Breakfast with Bonhoeffer sounds good too. I am totally with you on review books, there are so many coming out in March and I feel like I can't get to them all! I wanted to read Farmer Boy for the LIW challenge but it never happened. 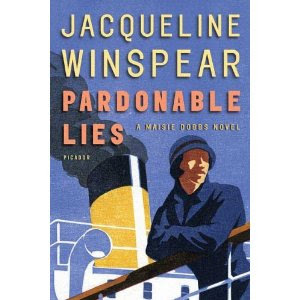 I'll be interested in your thoughts on the Maisie Dobbs book. I find them intriguing though the author's worldview and mine are worlds apart! Off topic: So because of your reviews The Mysterious Benedict Society books are highly rated in our house and recently we checked out the all the audiobooks (again for the umpteenth time) from the library. Today I had to laugh when I walked into 3 different rooms and in each one found a different kid and all 3 were listening to one of the MBS books! The Bonhoeffer book looks particularly good to me. Winona was my least fab MHL book. Breakfast with Bonhoeffer looks like it could be really good or really annoying. I'll be looking forward to your review. I will be lucky if I can get up my Scarlet Letter Review so unfortunately I won't be doing a nightstand post, but good for you getting all of your goals accomplished.